I resisted leaving the swag, due to the cold. The night had been one of our coldest. David had found the noise of the wind disruptive during the night. Despite this, diligently, he was up first and embracing his duties as camp barista. The fresh morning light made the dry native grass glisten, and bleached the deadwood around us. Gulping our coffee before the chill claimed it first, we had someone pass by in their Troopy. Other than that, our morning was pure indulgence. The wind of the night before had moved on, and it was blissfully quiet. Only the twitter of small birds occasionally arguing their way around the foliage of our campsite. We slowly rolled the swag and folded the chairs before breaking camp. Headed East along the Blue Rag. The clear glow of the new sun saturated the landscape’s colours. Feeling more comfortable covering familiar ground we followed the track before dropping off onto the Basalt Knob Track. A discerning name but the trail started thick with foliage and an easy descent. We descended for seemingly, an age. The trees were tall, thick and crowded us with their leafy canopy. An almost humid contrast to our ridge top camp. The track wound its way ever downward, the track narrowing and twisting in the shade. Damp, and the clay slippery. 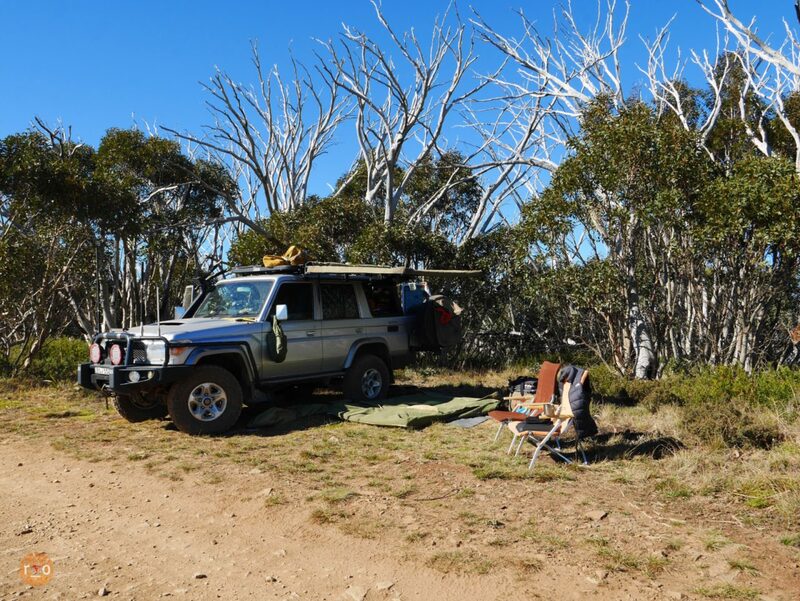 Between the hills, we stopped for a protein bar, enjoying the warmth, alone in the bush. After a few tighter, slippery hairpins we climbed again and the dusty, rocky trail found us again. 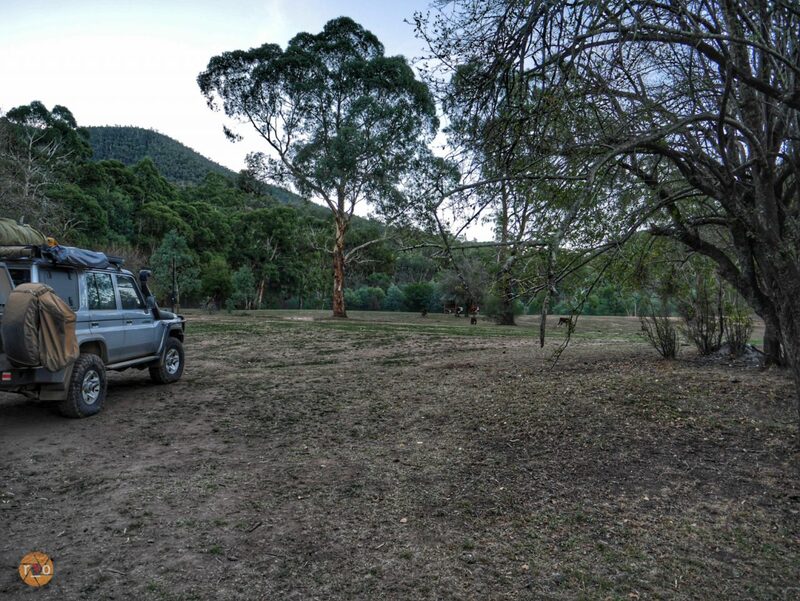 We came to a junction, trees tall and we could have been in any other Australian forest. Birds, undergrowth and umpteen thousand gumtrees between us and the world. Except for the red train carriage. Sitting bright and every bit as part of the junction’s landscape as ourselves. We had found Basalt Knob’s Hut. Continuing on, we stopped again at a cleared helipad type site. We had lunch in the sun. Salmon and salad sandwiches. We could see a track riding the impossible heights of the ridge yonder. Unbelievable, and yet – sight level with our current position. The realisation of our overall altitude sometimes lost during the constant ups and downs. We were coming to a fork. 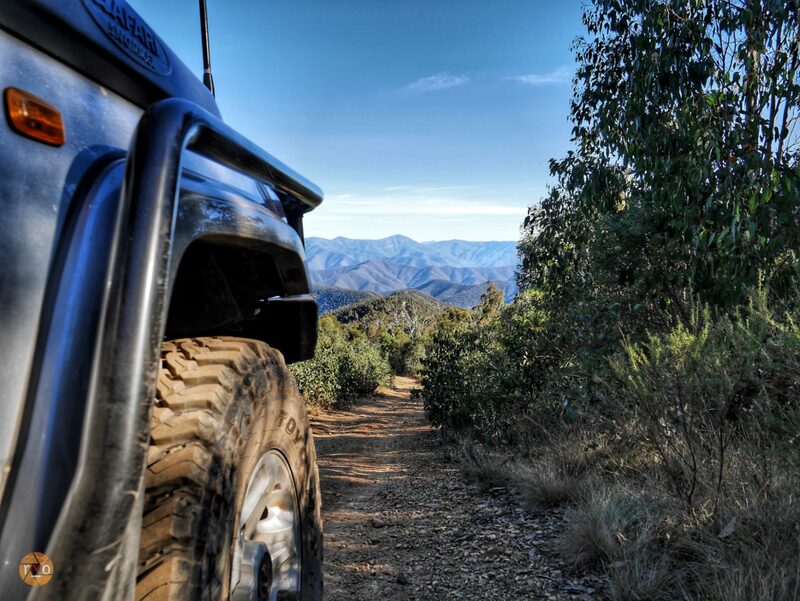 Continue along the Ritchie Road and the South Basalt Knob Track or maybe the Brewary Creek track. 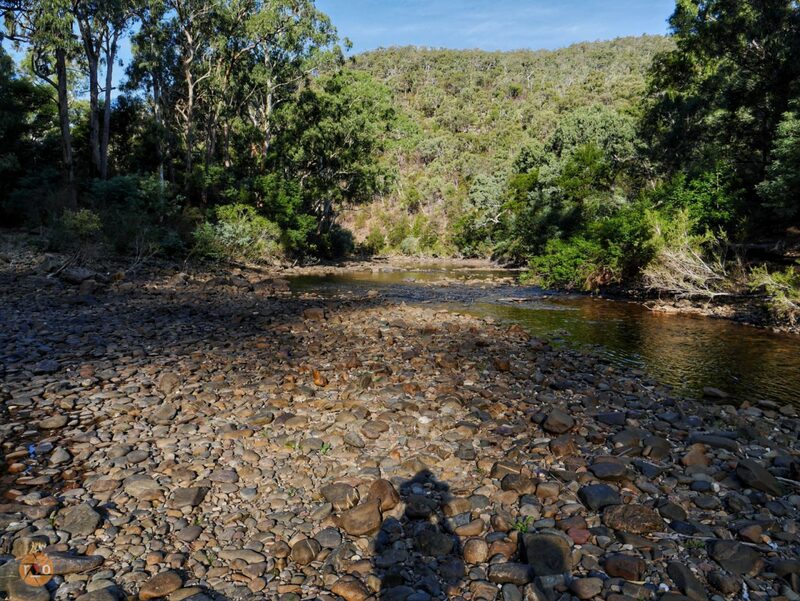 Given the time of day, Talbotville sounded like a viable campsite so the direct option was to complete the Basalt. Decided, we continued onwards, and downwards. Some of the steepest descent we had ever gone down, and would do this week. There are two sides to the spontaneous, the unplanned. The energising thrill of the unknown, and the heart stopping feeling of unpreparedness. With no research other than the Hema maps in front of us – the condition of the track was up to us to discover. South Basalt Knob is a tough little track. Incredibly steep, and quite washed out. A real treat for concentration. Staring hard at the cream silt-like dust and it’s decoration of washouts and rocks. 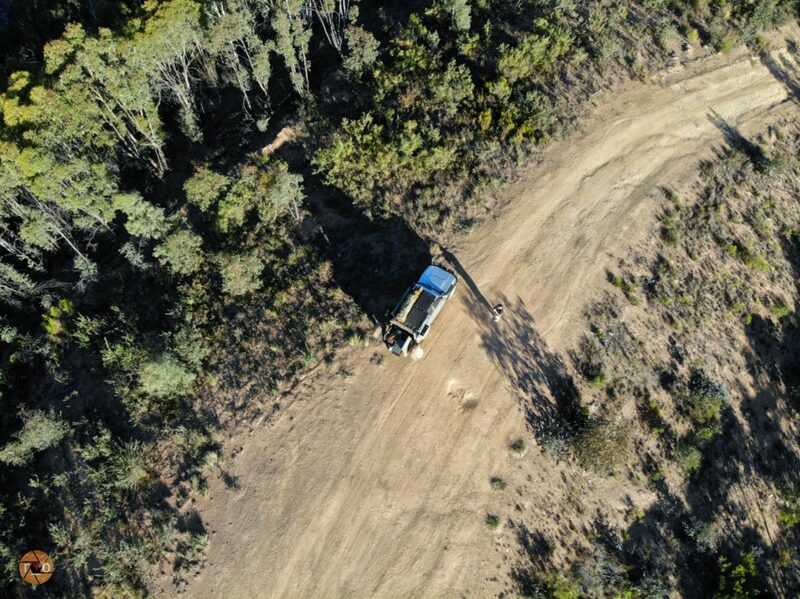 Given we were making the descent, low range was braking the vehicle nicely but it made the progress slow, albeit – thankfully steady. 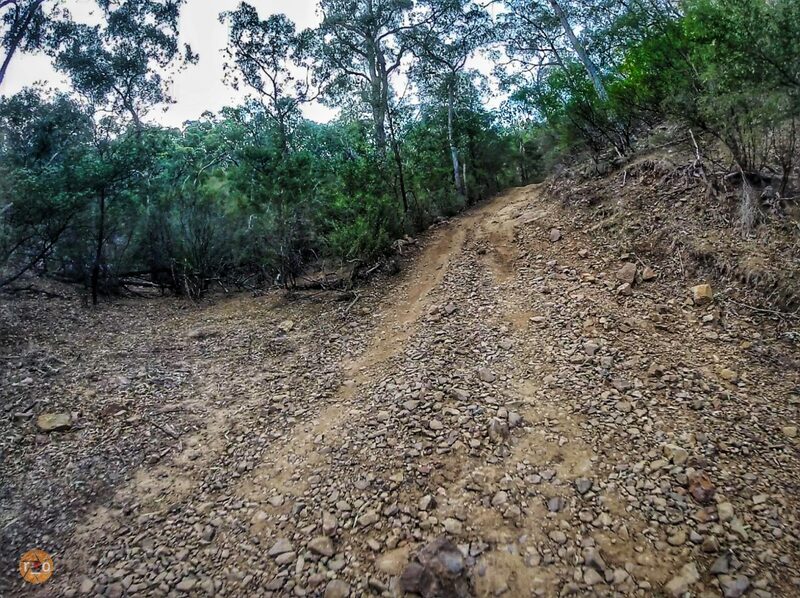 The soft dusty edges and ruts would make this a formidable climb. The track really steepens and we began losing altitude quickly. At one point we caught a glimpse of a clearing, the valley we suspected – something like a story, could be our campsite. Despite spotting Talbotville – the descent takes us the rest of the day. The erosion mounds provide a welcome stop for us both to take in the rich green mountains in front of us. Our view obscured by the roof of the LandCruiser given the angle whilst driving. 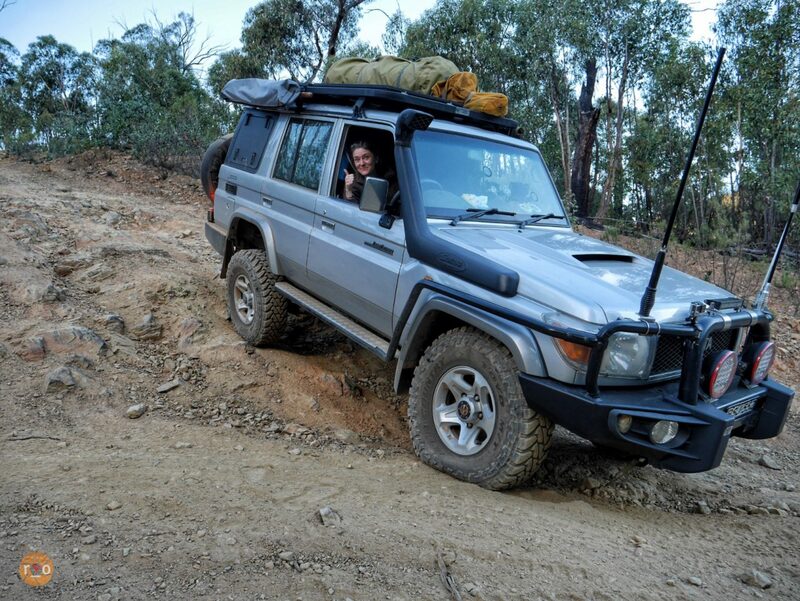 I’m not comfortable at rolling angles in the LandCruiser, more so if I am the one leaning towards the ground. It’s something only experience can wear down. Desert country rarely treats you to these kinds of angles. 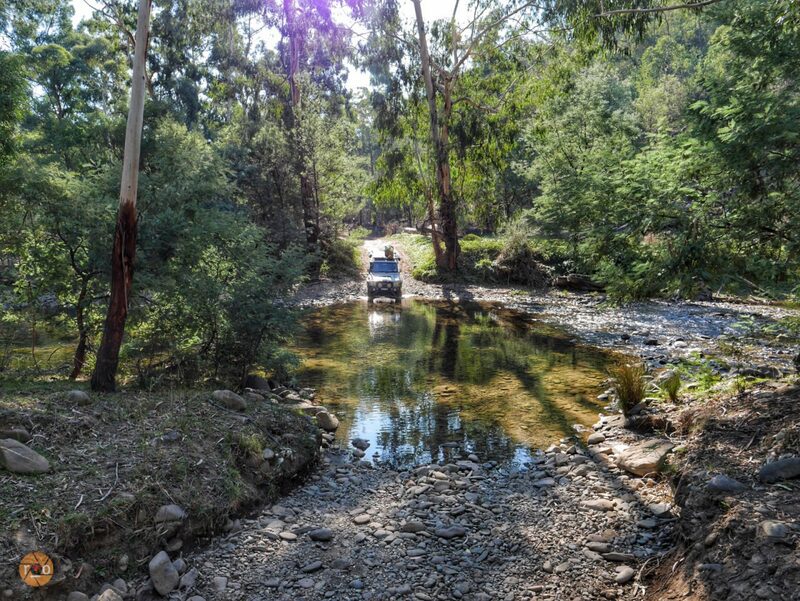 Normally, a slow washout to negotiate is just another day in the LandCruiser Office. The low range and v8 makes them look easy, I love how slow I can attack a bout of articulation, using power and the eLocker when I have run out of flex. Couple these kinds of angles with the views of the High Country? My palms are sweaty just recounting it. 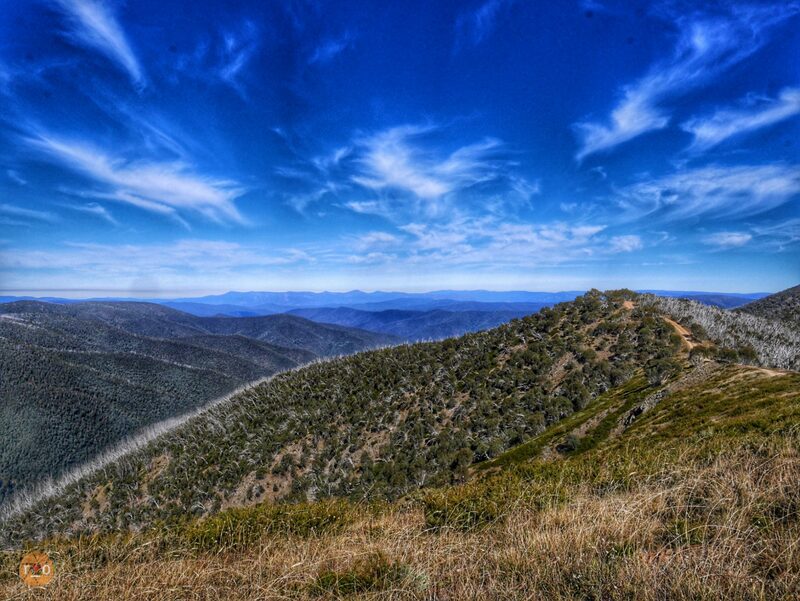 Those jaw dropping views of the sheer altitude, and the expanse of isolated Australian forest around you. Begins to feel all at once judgmental and snobbish to your cause. You’ve gotten yourself this far, what did you think this was? You’re in wild country now. DIY country. 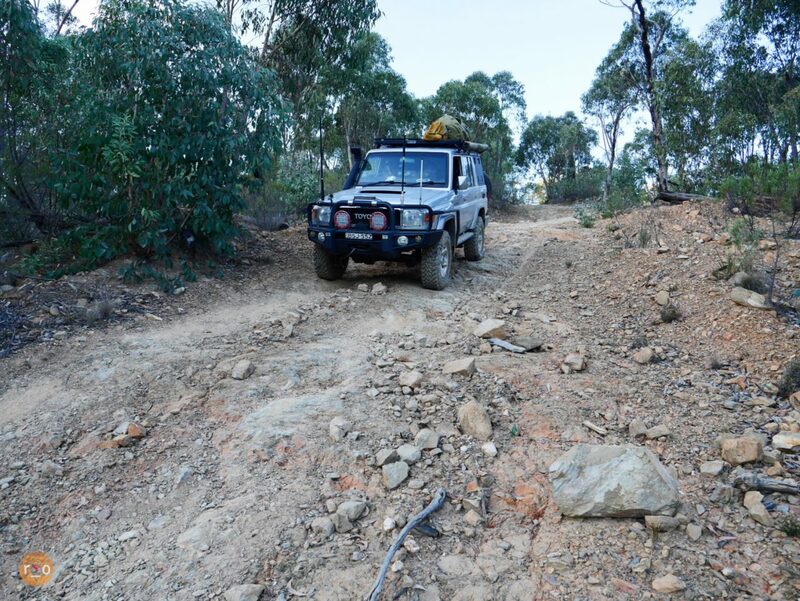 Because of this, hairpins/swtichbacks make me nervous, all of a sudden the nimble 76 Series feels like a high rise building, a wobbly Troopy on cheap springs and oversized tyres. The garish angle and choice of paths seems to accentuate this unreasonable feeling. Once I’ve convinced myself to press on, the underwhelming sense of stability washes over me and I’m usually laughing at myself half way around the bend. 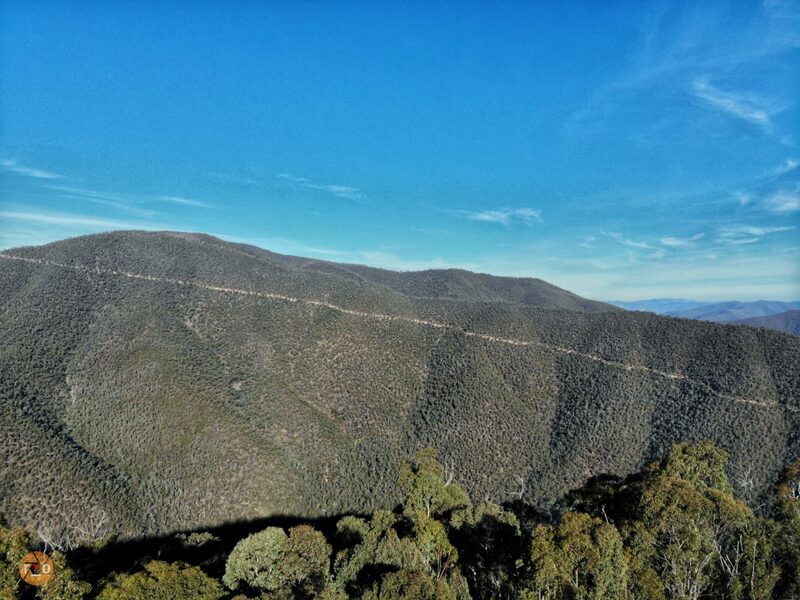 To break up the never ending staircase of the South Basalt Knob there was a hairpin I remember, and all that I recall are the kilometres of strapping young eucalyptus trees that might have slowed our fall had we rolled. Fear is very creative. The hairpin was less so, and we survived. So later on and we were given a choice of a seemingly direct route straight ahead, or a rude hairpin, I went with the former. It looked fairly straight forward from up ‘here’. However, as soon as it was somewhat too late to back out, the track bared it’s teeth. The steepness was as real as it looked from the top, but teamed with the shade, it’s rocky steps were disguised until you were right on top. 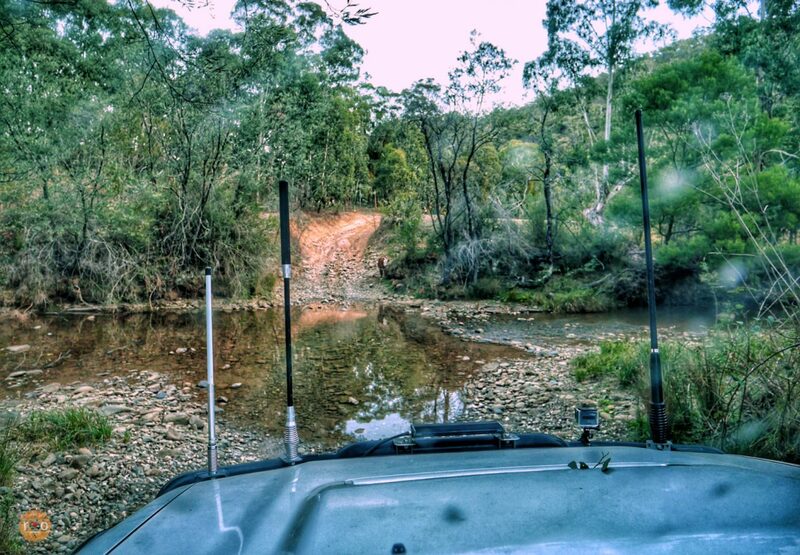 I kicked David out of the LandCruiser to spot a path. Not that there was much of a choice, to avoid any angles outside of the descent, slow and low was my only real approach. Seatbelt locked, holding me to the seat. I inched forward. This little adventure would prove that I could stall the 76 Series. At one point, poised between some significant steps, two feet on the brake pedal, seat belt was tight across me with the angle I was at. Low first and inching the Toyo MTs down, I finally managed to force the engine to a stall. Anyone with a 70 Series would agree, these engines love it low and slow, and are quite difficult to stall. Suspense over, the steering wheel slick from my stressed out palms, I made it. Even after the hard left turn required to return to the now apparent main track. It was hard to tell but maybe our direct route was the secondary one. Not sure, nonetheless – I’d bullied some flex out of the 76 and we did it. The silent applause from the dusty gumtree’s saw us off, we still had some kilometres of hard descent to go, albeit nothing compared to that. Another bush junction, this one showed we were near water, with flood damage and debri. It gave me a chance to get out and let the tide of adrenaline course it’s way down to my toes and diffused, back again. From here we had to cross some water and we should find camp. The sheered off banks showed us what the water crossing could be like, but today – we enjoyed a pebbly puddle by comparison. The climb out on the other side was steep and washed out but no challenge, save for avoiding resident cattle. In stark contrast to the our letterbox view of the hard angled track, the valley was soft, green and dappled with golden walnuts and poplars. 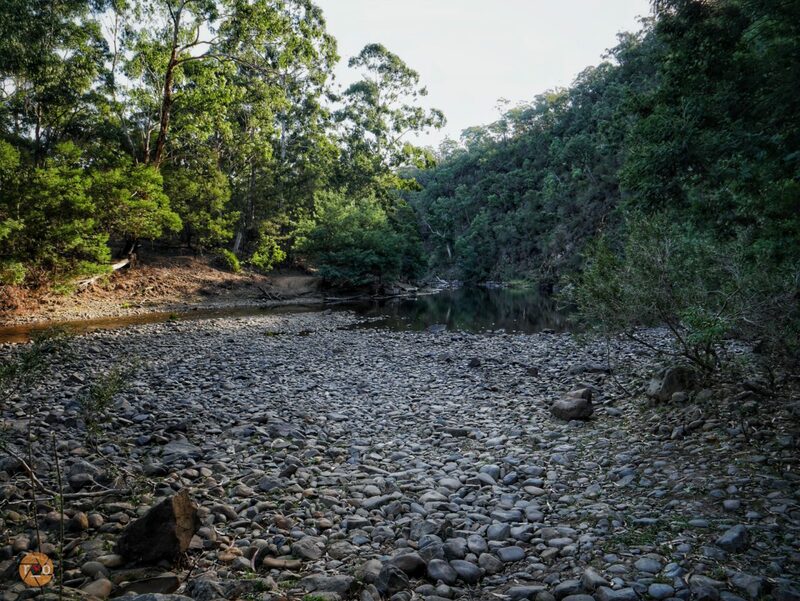 Ancient gumtrees laced along the water course. My eyes adjusting, we ambled across the paddock, looking for a camp. We were spoilt for choice, there was noone around. We had our pick of any of the ancient fruit and nut trees to camp by. We spotted a camp, far off through a thicket. Respecting their appreciation for space, we parked back towards our entry point under the shade of a beautiful old walnut tree. The quiet of the valley, the warmth of the valley, immediately washed over us. The awe inspiring heights of Blue Rag left behind, the hair raising descent into Talbotville. Its establishment was self explanatory, irrespective of the gold. A flat, sheltered waterfront would be our home tonight. 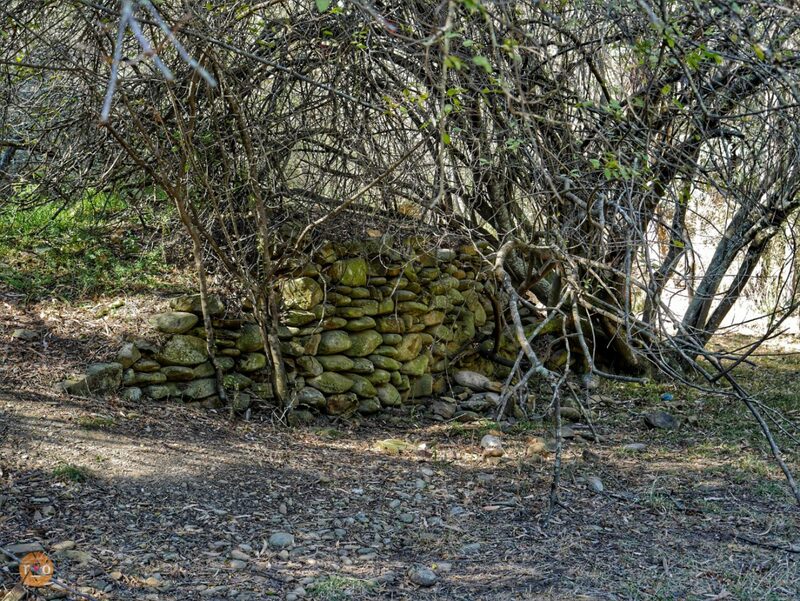 The old pipes sticking out of the ground and stone walls of yesteryear. Before long, the light left us, our day shortened by the sentinel hills around us. 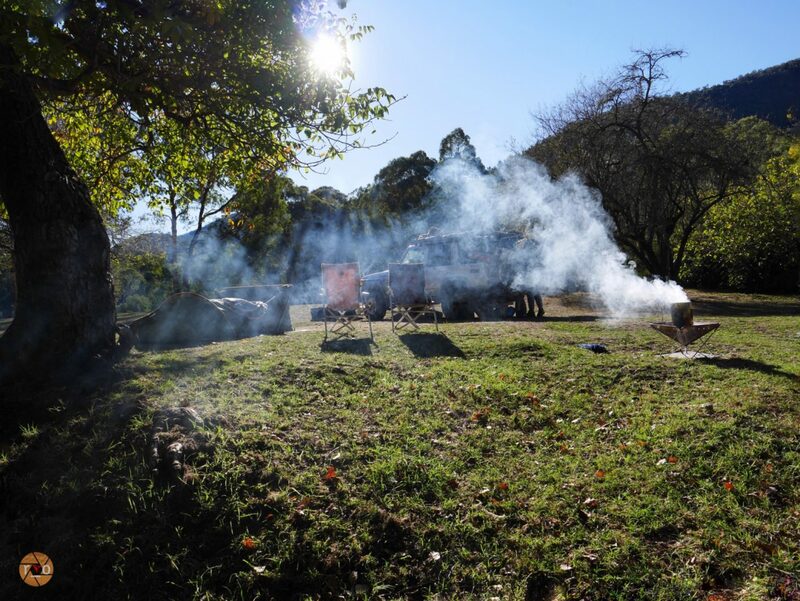 We had the charcoal smoking in the firepit for dinner and warmth. Swag thrown under the tree, waiting to be liberated from its bag. We both slept very well that night, not only was there the remains of a lawn under us, but the alpine chill was for more amiable at 300m above sea level. Our well chosen position bathed us in sunlight the following morning and we were hesitant to rush. Starting up the charcoal, I retrieved some home laid eggs and local bacon from the fridge. Enjoying a coffee with the morning birds. 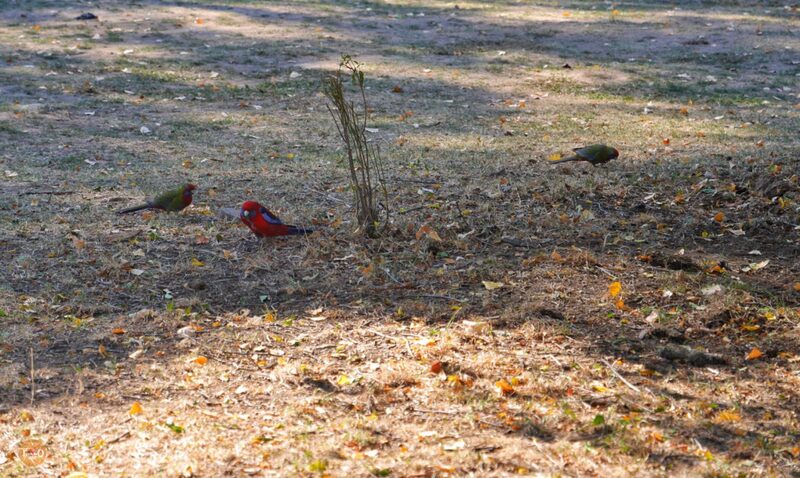 There were King Parrots, Rosellas, finches, black cockatoos, fairy wrens, grass parrots, kookaburras and bowerbirds. I pined for a bigger zoom lens, but enjoyed sitting at the oversized picnic tables and attempting a few shots anyway. 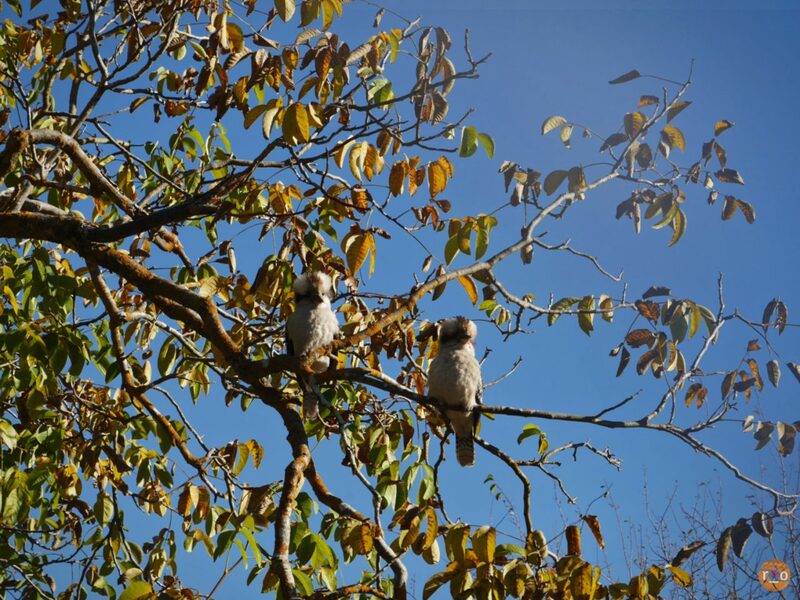 I had just added the bacon to the grill, and a pair of Kookaburras took up residence in the tree above us. Out of nowhere, our solitary neighbour appeared also. 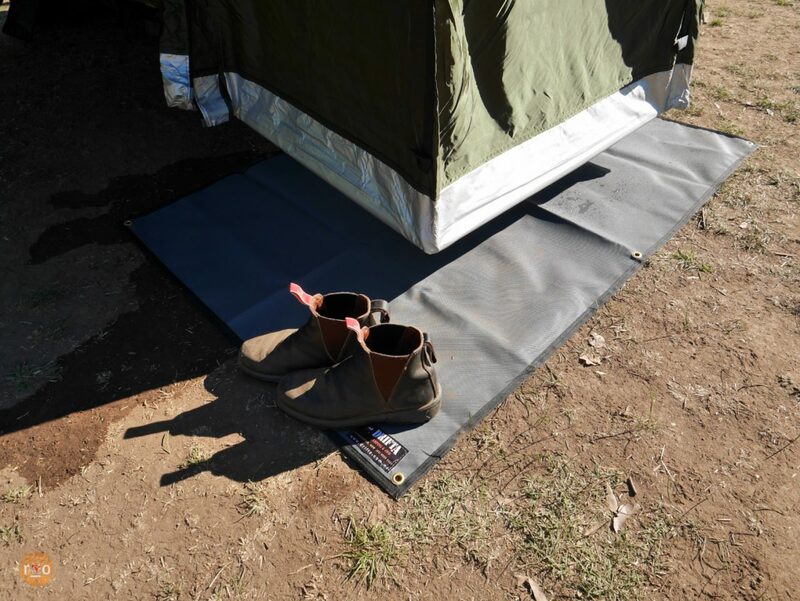 We chatted, all the while I thought – he just missed out on our camp brew, so I put the billy on again. He was a hunter and asked if we had spotted any deer. I tended to the bacon while David chatted about the tracks around us. I cracked eggs into the frypan and turned the bacon for the last time. Just as I was returning to the firepit with our plates, a Kookaburra swooped and leveraged a few strips of my Canberra grown, charcoal cooked streaky bacon, straight off the grill. Just like that, he had patiently waited for it to be perfectly cooked too. The caucophony that followed was a comedy. The hunter guffawed, never seeing that before and strolled away laughing. The magpies and bower birds and other kookaburras that were, until now, silent and unseen above us made their presence known, each vying for their share of the steal. 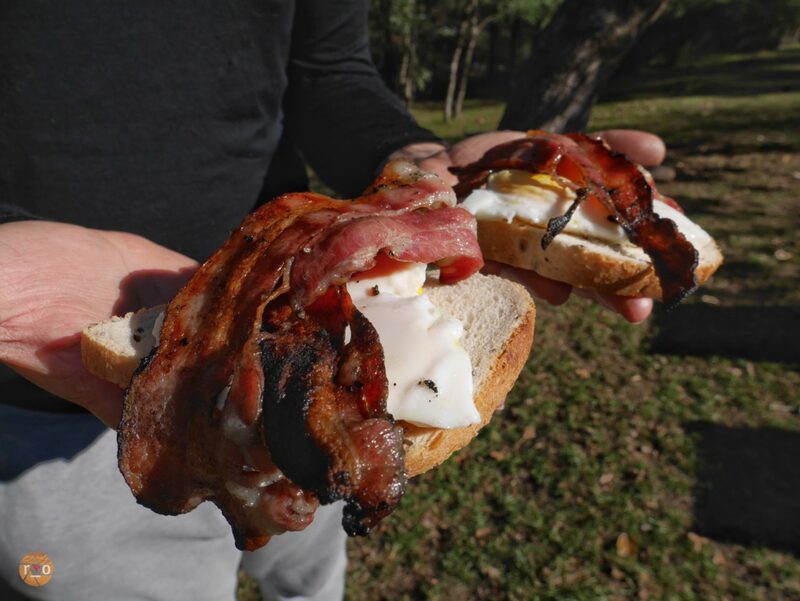 Perhaps by design, the Kookaburra had left us each enough for a classic bacon and egg sandwich, but there would be no seconds. I also learned that Bowerbirds covet all things blue, and bacon. I chased my camp breakfast with a 12v hot shower. Such was the luxury of the locale. And after a cursory look at the map, we rolled the swag and crossed the Crooked River again. We were promised something like 27 crossings according to the sign. An easy trail, made easier by the lack of traffic or water to cross. Most were dry or no deeper than the numberplate. We drove past the old town sites, mostly private owned now and not accessible. Climbing again we were headed in a general direction of Dargo. 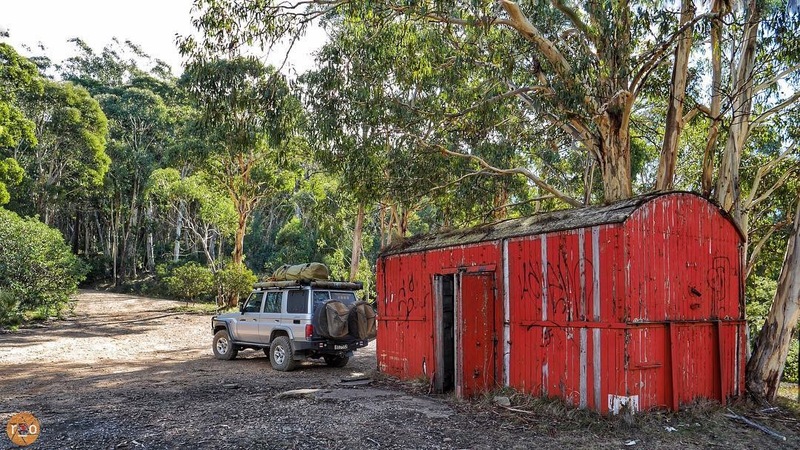 We ended up on the Crooked River Road and it grew a little boring after a while so I pealed off onto Collins Track, there was a hut icon on the Hema, at its end. Collins was steep and loose with scree. 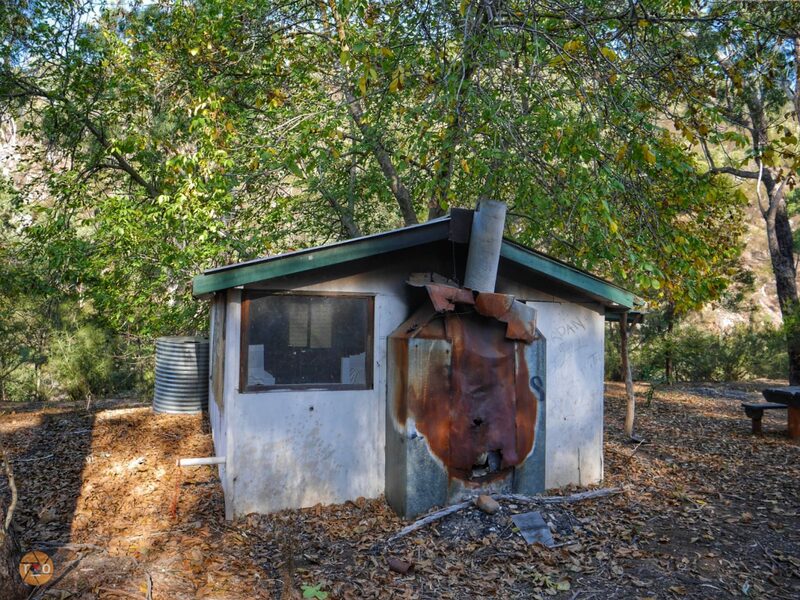 The hut, was loose with morals. Comprised of sheet iron and plasterboard. The paper wasps that had claimed the doorway would have no competition from me. 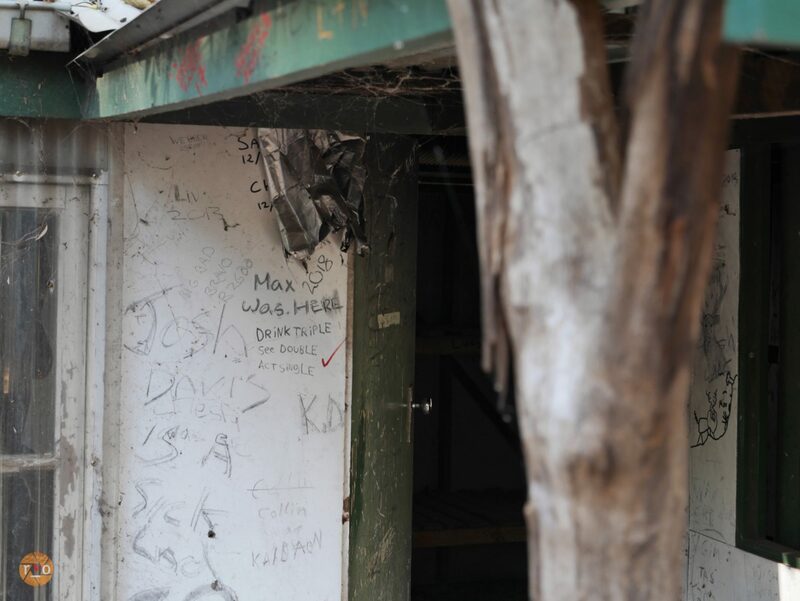 There was a plethora of graffiti that described the hut’s modern purpose. 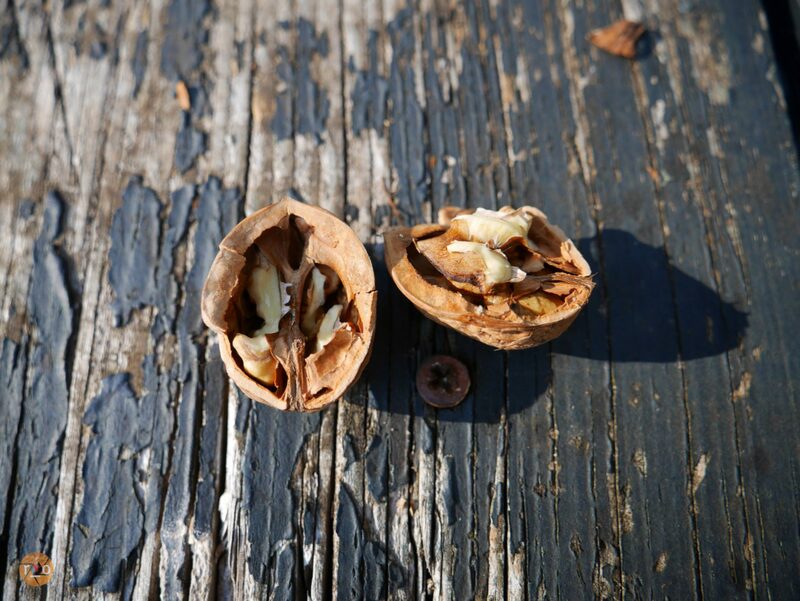 It was however, crowned by a splendid walnut tree and we feasted well. We walked the rest of the trail, its grey sand was deep and soft and it eventually looked rather neglected. Unsure if it would get us through, we decided to backtrack. 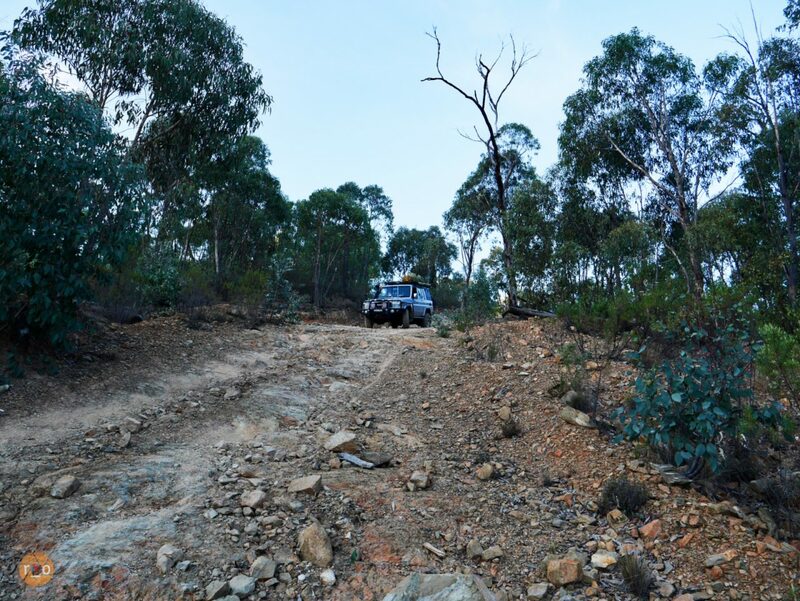 Collins climb is a good one, couple of hairpin turns to practice – one requiring a three-point turn to negotiate. And just like that, we were back on the main road which turned into bitumen, where we aired up the tyres. 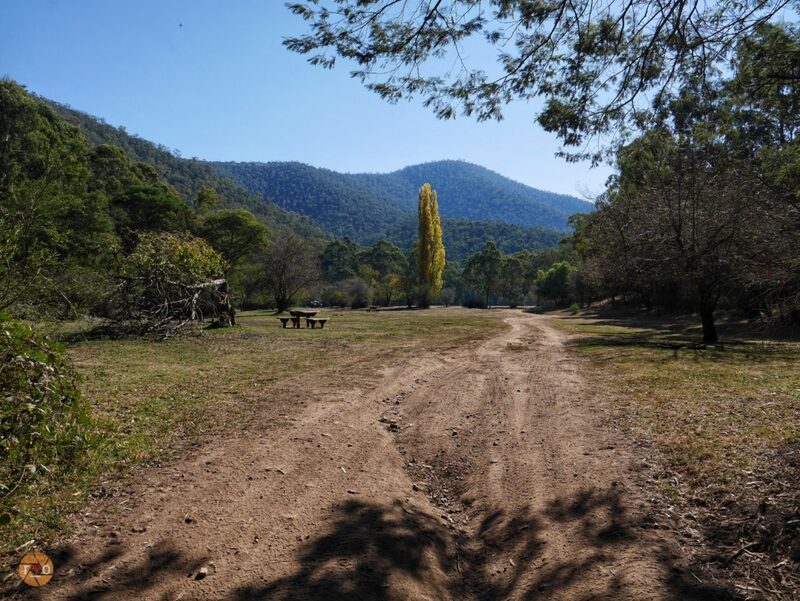 In the lowering light of the afternoon, Dargo presented a pretty little settlement full of large trees. I didn’t need any directions to find the Hotel, its infamous roof was seen from down the road. We said hello inside and arranged to camp along the creek behind the pub. At the general store, we purchased some more meat, firewood and snacks for later. Unrolling the swag, we walked back up to the pub and its large fireplace. And that’s where we stayed, thawing out, sipping a diluted Coke and admiring the decor of nightmarish 4×4 photos and old wares. David ordered the Bologna Schnitzel and I ordered the Parmigiana. We opted for vegetables to offset our selection. Unbeknown to me, the vegetables would be potato bake, pumpkin, broccoli and cauliflower, corn and honey carrots. Try as I might, I couldn’t finish my plate but I hope I made a good dint. The bubbles of the Coke likely handicapped me further. 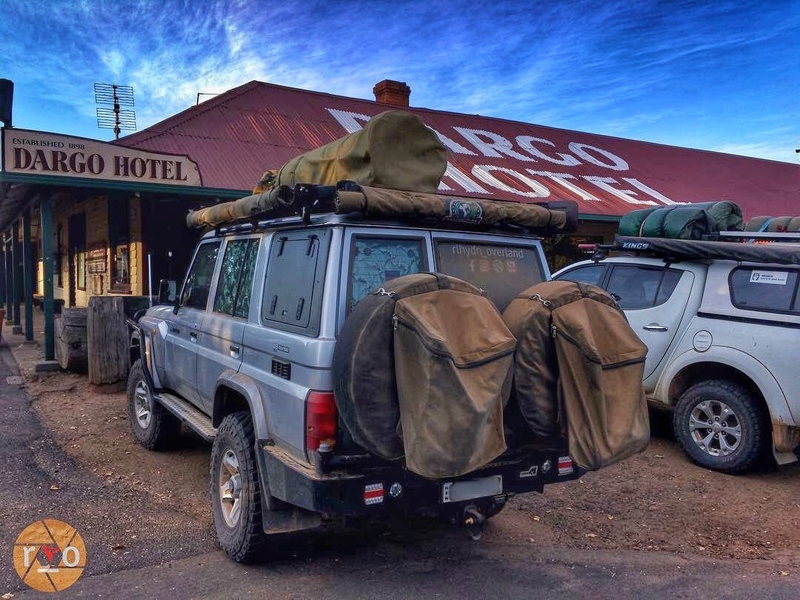 Beware travellers, visit Dargo Hotel hungry, very hungry. Heads bowed we studied our paper map of the region, planning, whilst we ruminated. 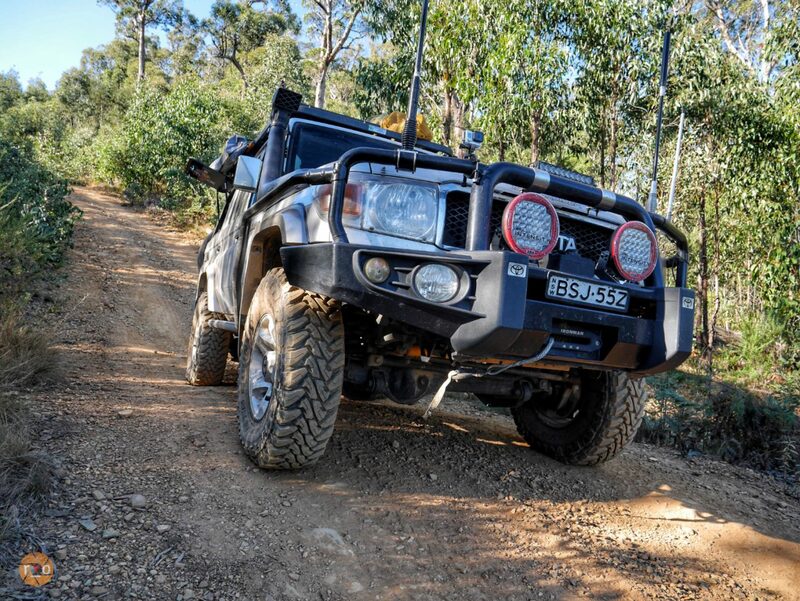 There was no doubting our course, tomorrow we would poke the LandCruiser up Billy Goats Bluff. Thanks for a beautifuly written piece. 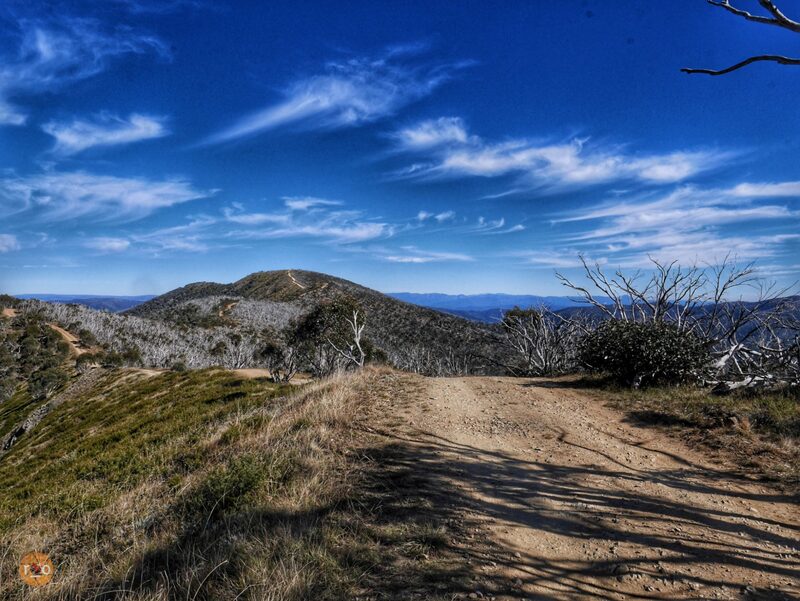 Am looking forward to another visit to the high country this Christmas. Thankyou very much Don! We’re also plotting and planning for a return trip in the coming months. Adventure in spades down there.